Susana Soares, Senior Lecturer in the Department of Engineering and Design at London South Bank University (LSBU), has created a device that can detect cancer and other serious diseases - using trained bees. 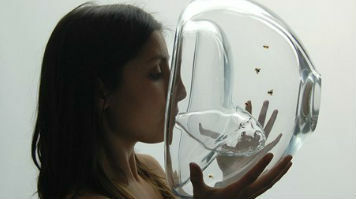 Susana's project, recently presented at Dutch Design Week, explores how we might co-habit with natural biological systems – such as bees - and use their potential to increase our perceptive abilities. Honeybees are known for their intricately sensitive sense of smell. They have no noses, but their feet, tongues and antennae all have olfactory glands that detect smells. Thought to be more accurate than that of a sniffer dog, bees are able to detect specific airborne molecules - including the biomarkers associated with diseases such as tuberculosis, and lung, skin and pancreatic cancer. Using a two-chambered glass dome, which enables the bees to detect certain odours in human breath, the bees are trained to recognise a wide range of natural and man-made chemicals and odours – including the biomarkers associated with certain diseases. "The bees can be trained within 10 minutes," explains Susana. "Training simply consists of exposing the bees to a specific odour and then feeding them with a solution of water and sugar, therefore they associate that odour with a food reward." Once trained, the bees will remember the odour for their entire lives, providing they are rewarded with sugar. The glass domes have two enclosures - a smaller chamber where the bees 'diagnose'- and a larger chamber, where the previously trained bees are kept for the short period of time necessary required for them to detect general health. Once the person being tested has exhaled into the smaller chamber, the bees will rush into it if they detect the odour they were trained to target. Tapping in on bees' natural talent to detect various odours, awareness of Susana's project is rapidly expanding: "There's plenty of interest in the project, especially from charities and further applications as a cost effective early detection of illness, specifically in developing countries," Susana says.